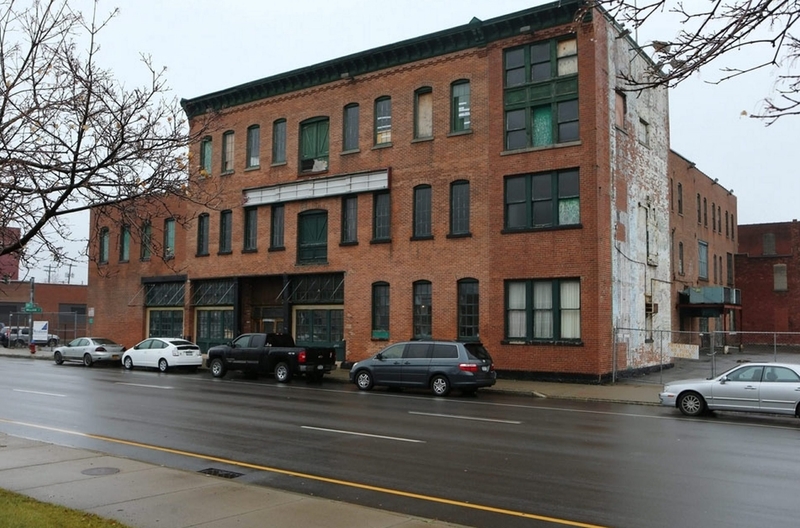 Two long-vacant and neglected Buffalo buildings are on track for revival, supported by incentives approved by the Erie County Industrial Development Agency. The IDA board Wednesday backed tax breaks for a $32 million project to revamp an empty factory at 500 Seneca St. and an $8.1 million project called the Planing Mill, which will revitalize the former Spaghetti Warehouse building at 141 Elm St.
500 Seneca’s partners are Savarino Development and the Frontier Group of Companies. The project will receive $1.15 million in incentives: $1 million in sales tax savings and about $150,000 in mortgage tax savings. The city and county will still receive their full annual real property tax payments, the ECIDA said. 500 Seneca, once the home of a F.N. Burt Co. factory, will consist of 300,000 square feet of office space, and so far has two tenants lined up: Frontier and the BCOME Buffalo job-training program. Combined, they will fill about 24 percent of the building’s space. Craig A. Slater of Buffalo-based Frontier Group, whose core work is demolition, said the project partners needed “proof of life” at 500 Seneca to show its viability, after owning the property for about three years. The building has been vacant for almost 10 years, and parts of it date from the early 20th century, said John C. Cappellino, the ECIDA’s executive vice president. The sales tax abatement on materials and equipment will be restricted to the building shell and core, and will apply to materials and equipment for tenant finishes, but only for nonretail tenants, according to the ECIDA. Project leaders hope to welcome the first tenants in the fourth quarter. The Planing Mill project on Elm Street is led by an affiliate of TM Montante. It will include about 22 loft-style apartments, with rents of $900 to $1,900 a month. Residential space will account for about 75 percent of the 44,000-square-foot property. The other 10,800 square feet will be devoted to office space, with C&S Engineers taking about 6,500 square feet. C&S will relocate from 90 Broadway, where its lease is expiring, and plans to add one job, bringing its total to 20 employees. The project was approved for sales tax savings of about $214,000, and 1 percent of the final mortgage amount, estimated at $45,000. The sales tax break on materials and equipment for the project will be limited to the building core and shell and the residential component of the project; the buildout of C&S’s space and the vacant space was excluded from the incentives, the ECIDA said. Project leaders said the Planing Mill is daunting, both physically and financially. Two other development teams’ previous plans for the site fizzled. The property has been vacant for a decade, after Sensationz nightclub closed in 2004. The building was built in phases – some parts are 135 years old – that don’t line up internally, which requires a costly correction, Vaeth said. Portions of the property have also suffered from neglect over time. But the development team wants to restore the building’s historical characteristics, such as its windows, Vaeth said. Another challenge is financial. TM Montante tried without success to bring in outside investors, Vaeth said. And Christian Campos, TM Montante’s chief financial officer, said the developer’s bank would not commit to construction financing without the ECIDA incentives. “Essentially the main issue the bank has raised is our ability, the project’s ability, to comfortably meet the debt service,” he said. Buffalo Urban Development Corp. last year approved a $500,000 loan for the project. The ECIDA’s vote was 14-2, with Richard Lipsitz Jr. and Michael H. Hoffert voting no. Hoffert said he could not support the incentives in light of the project’s minimal projected job growth. Separately, the ECIDA agreed to lease part of its former building, at 143 Genesee St., to HealthNow New York for two months, starting Saturday, at a cost of $5,900 per month. HealthNow will use the space to conduct its annual labor negotiations, said Andrew Schoeppich, the ECIDA’s chief financial officer.